Dr Nelson Menezes was born and brought up in the city of Panjim, far from the thought that one day he would be awarded a prestigious honour in the USA for his contribution to medical science. Son of late Caetano Menezes and late Eufregina Menezes from Divar, and the youngest sibling to Alzira Fernandes, Dr Placido Menezes, Sylvia D’Souza and Dr Anthony Menezes, Dr Nelson is fondly remembered by his two sisters living in Goa. Both retired teachers from Mary Immaculate Girls’ High School, Panjim, they look forward to spending quality time with their brothers, Dr Placido and Dr Nelson, who are based in the US. Alzira Fernandes, 14 years older than her youngest brother, Dr Nelson, reminisces, “Nelson was always the bright one in the family. We used to live in Corte De Oiteiro in Panjim and my father had a drug store, Drogaria Luis de Menezes in Panjim. Nelson was only one year old when our father passed away. My mother single-handedly brought us up and we are grateful to her. Nelson was very studious and stood third among all the successful candidates of Goa for the SSC examination. He was awarded People’s Bronze Medal and S A Barne prize for standing first in his school, People’s High School. Placido was also brilliant in studies and had stood first in Goa at the SSC Examination. He is now a noted orthopaedic doctor in the USA and both brothers live just 20 minutes away from each other. Alzira and Sylvia lived with the brothers for two months this year. “We both were there in the USA in the months of June and July. They both are living very busy lives with hectic schedules throughout the day. Even when Nelson visits Goa, he is here only for a few days as his medical cases start piling up back in the USA,” adds Alzira. After completing his SSC, he studied at Dhempe College of Arts and Science, Miramar and graduated from Goa Medical College in 1980. He completed his Masters in Surgery, University of Bombay in 1984. He then completed his Fellowship in Surgery at The Royal College of Surgeons in the United Kingdom and proceeded to United States to do his training in Vascular Surgery. He completed his surgical residency at The Brooklyn Hospital Center (TBHC) and went on to do an Endovascular Vascular Fellowship at the Baptist Memorial Hospital in Memphis, Tennessee, as well as an Accredited Vascular Fellowship at State University of New York (SUNY) at Stony Brook, NY. He was appointed the Chief of the Division of Vascular Surgery at TBHC in New York City in 1998, affiliated to the Mount Sinai Health System, a position that he still holds. He is responsible for bringing vascular surgery at TBHC into the endovascular era. He remains the Medical Director of the Vascular Lab, which gained accreditation under his leadership, and is an Assistant Professor of Clinical Surgery at the Icahn School of Medicine at Mount Sinai. His main field of interest among other things is endovascular revascularisation of lower extremities. The vascular lab performs advanced noninvasive studies to check for the status of the circulation in various parts of the body. Dr Nelson specialises in complex aortic endovascular reconstructions in patients with abdominal aortic aneurysms as well endovascular revascularisation (rechanneling of the arteries) of the lower extremities. “Open surgery on the abdominal and thoracic aortic aneurysms (ballooning of the main artery in the belly and chest) used to be a long, complicated major surgical undertaking with significant incidence of mortality and morbidity. Thanks to the endovascular approach, specialised artificial grafts or synthetic tubes can be placed in the aorta and its branches through tiny incisions achieving the same goal as open surgery but with a relatively smaller insult to the human body. This however needs high powered skills and precision because there is very little room for error,” says Dr Nelson. He is a part of the teaching faculty and Assistant Professor of Clinical Surgery at the Icahn School of Medicine at Mount Sinai. 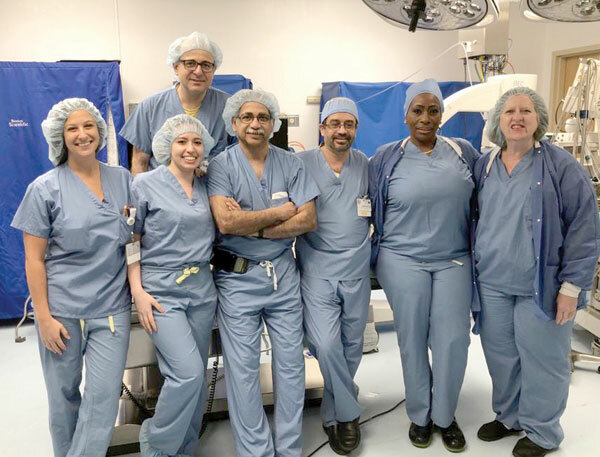 He has mentored and trained general surgical residents, ten of whom have gone on to follow careers in vascular surgery and are top vascular surgeons in various parts of the United States. He has been awarded Teacher of the Year awards multiple times and has been selected in the Castle Connolly Top Doctors in New York for many years. He is recognised as one of the top vascular surgeons in New York by US News and World Report. He was also awarded the Distinguished Service Award by his peers at TBHC. He is a member of the Society of Vascular Surgery, New York Society of Vascular Surgery and The Vascular Access Society of the Americas. He is board certified in general as well as vascular surgery and a Fellow of the American College of Surgeons. He resides in Brooklyn, New York with his wife, Neshba, a classical pianist, and two daughters, Priyanka and Carla. Priyanka is pursuing a Masters in Adolescence Maths Education and Carla is pursuing Masters in Public Health. Living in the USA for nearly 30 years, Dr Nelson visits Goa once every couple of years. “I miss my friends, relatives and the calm ambience of Goa and the stuff that I used to take for granted when I lived in Goa i.e. attending church services at the Panjim church, eating bhaji puri in Cafe Tato and small talk with my friends.” His hobbies also include reading, playing ping pong and travelling. To conclude, Dr Nelson gives his advice for doctors in Goa: “India is an emerging technology market and doctors in Goa are positioned to take advantage of the cutting-edge medical technology, provided we have dedicated mentors to our young graduating physicians.”friends.” His hobbies also include reading, playing ping pong and travelling.